In Rome, what you are looking for are diamonds in the rough. 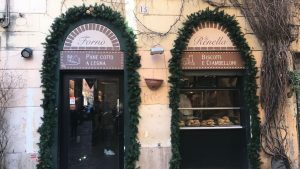 This place I tried on the Roman Food Tour, an event sponsored by SAI. We went around the neighborhood and tried different foods. 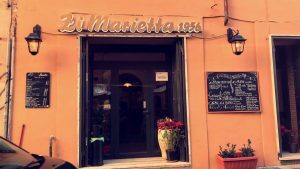 This place named Suppli has become my favorite place to eat something quick in Rome. Their supplis are award winning and the best I have ever tried. Supplis are an Italian snack. It is a deep-fried ball of rice with tomato sauce and mozzarella. It is 1.50€ a great price and surprisingly filling. 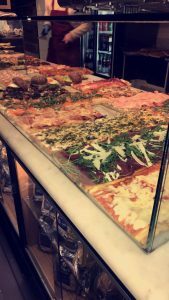 Suppli also offers pizzas, pastas, chicken, potatoes, and fried mozzarella sandwiches. Everything in is super affordable and delicious. But what makes Suppli the best place to eat is the treatment. Everyone is super nice and make you want to come back and enjoy a suppli. This restaurant is my favorite for a sit-down lunch or dinner. The food is delicious, close to the JCU campus, and most importantly, very authentic. 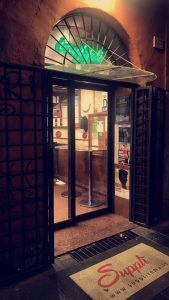 Whenever I go to eat here, there is only old Italians and no tourists in sight. The menu is in Italian and may be hard to read and that is when Google becomes your best friend. My goal by the end of the semester is to try everything on the menu and so far I am halfway and I have loved everything. The Caico de Pepe is a Roman pasta and happens to be the vegetarian option and it is my favorite and I am not even vegetarian. The antipastis are delicious. I have tried fried artichoke, baccala, and zucchini flowers and they have become my favorite antipasts. Not only is the food great, but for a full sit down meal for 2 euros, it is around 30 euros which is very cheap. If you ever want a sit down meal, go here! You will not regret it. It’s how you expected to eat in Rome. Don’t fall for tourist traps. This place is a hidden gem right next to the JCU campus. 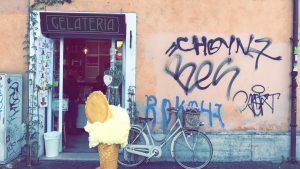 Not all gelato places are good, especially ones near tourist attractions. I once got a gelato near the Spanish Steps and I spent 5 euros on a small. The only reason I got it was because I needed to recreate the Audrey Hepburn Roman holiday moment (the things we do for Instagram). But this gelateria, is truly great and a great price. 2.50 for a small and the largest is bigger than my head and it is 4 euros. I have been in Rome for about six weeks now and I have gone through three of their punch cards (each punch card had 10). I have tired pretty much every flavor at this gelateria and all are good but my favorites have to be nocciola (hazelnut), cioccolato bianco (white chocolate), and biscotti (cookies). But I recommend trying them all! Delicious gelato near school. Reward yourself between classes! This pizza place is too die for. I eat here in between my classes because they have so much variety of toppings and the quality is amazing. My favorite is prosciutto and artichoke. This sounds “out there” but try it then you will understand. They also have a bunch of great pastries and sandwiches. My favorite pizza place in Rome. On Sundays, there are farmers markets opened up 10 minutes away from the Vatican. I came across them randomly walking back from the Vatican museum and I truly felt like I was in Rome. The were little farmers markets selling fresh cheeses, prosciutto, fruits, and jams. I prefer to do my grocery shopping at the farmers markets because the prices are very affordable, you can try samples of what your buying, and everything is fresh. Here, you can see all the different toppings they offer and it changes by the hour in order for the pizza to stay fresh at all times. Geraldine is a spring 2018 SAI Rome student from Suffolk University.